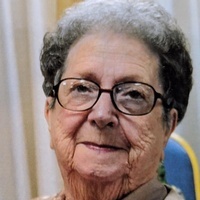 Alena Faye Hartsock, 90, of Grayville, Illinois, died Monday, January 21, 2019, at Richland Memorial Hospital in Olney, Illinois. She was born January 22, 1928, in Grayville, the daughter of Herbie Lloyd Williams and Bessie Leona (Eck) Williams. She married Kenneth Charles Hartsock on November 4, 1954, and he preceded her in death on October 28, 1964. Alena was a homemaker, but she worked outside the home as a telephone operator, meat cutter, and retail clerk. She was well known for her love of baking cookies and her cookie jar that she kept well-stocked on her kitchen table. Survivors include sons Stephen L. (Beth) Hartsock, Kenneth (Lori) Hartsock, all of Grayville, Jay (Stephanie) Marshall of Eagle, Idaho; daughter Linda Gail (Mike) Murphy of Herrin, Illinois; grandchildren Holly (Christopher) Lewis, Andy (Jessica) Williams, Stephen I. Hartsock, Jackie Hartsock (Chris Daggett), Rosie (Danny) Kuykendall, Dannah Hartsock, Elliott Hartsock, Mitchell Kleinschmidt (Katie), Amanda Kleinschmidt, Owen Marshall, Aidan Marshall; and numerous great grandchildren. She is preceded in death by her parents; husband; and sister Helen Marie “Rosie” Bump. In keeping with Alena’s wishes, her remains were cremated. A visitation will be 2-4 pm, Saturday, January 26, 2019, at Cook Funeral Chapel in Grayville. Memorials may be made to the Grayville Senior Citizens and will be accepted at Cook Funeral Chapel.